Families connect us to our own history and to the history of the world around us. In this lesson, students explore this second set of connections, talking with family members about landmark events they have witnessed in their lifetimes to learn how history touches our lives. This lesson plan consists of four learning activities that you can use together as a unit or adapt separately to your curricular needs. The Past and Personal Experience Begin by talking with students about the relationship between history and personal experience. Ask, for example, how many could tell the history of what happened in class two weeks ago? How many could tell what happened in your classroom ten years ago? Help students recognize that our knowledge of the past is limited by our personal experience, but we can expand that knowledge by drawing on the personal experience of others. Explain that this is how historians work, by gathering evidence that can help them find out what happened in the past and what people who lived back then thought about it. Have students brainstorm ways a historian could find out what happened in your classroom ten years ago. For example: Interview former students and their parents; gather papers, notebooks, and pictures they have saved; look up school records from that era. Use this exercise to help students understand the kinds of evidence historians collect to reconstruct the past. Follow up by having students plan a time capsule that would tell future historians what is happening in your classroom today. What kinds of evidence would they put into their time capsule? Tell students that in this lesson they will be working as historians to gather evidence about several important events from the past. Provide them with a set of the images shown below, which come from the National Archives and NASA, and ask if they can identify any of these events. Explain that all of these events occurred long before they were born, but that members of their families—parents, grandparents, and other older relatives—will probably remember them. It will be the students' job to find out what is happening in these pictures from family members who lived through one or more of these events. In what year did it happen? Why was it an important event? What do you remember about the event? How did people feel about it? Did it affect you and your life? What was happening in our family at that time? Did we have any important events back then? When students have completed their research, explore the evidence they have gathered in a class discussion. First, work together to arrange the five events in chronological order on a timeline, based on the dates provided by the students' family members. Talk about any uncertainties or inconsistencies that emerge, and ask students how a historian could resolve such questions (for example, by looking for reports on the event in old newspapers). Provide students with the correct date for each event as needed. Next, have student volunteers describe each event and its importance, as recalled by their family members. (Have older students read from their interview charts; help younger students recall their interviews by prompting them based on what their family members have written.) Again, talk about differences that emerge and the element of interpretation involved. To what extent could one combine these various points of view? On what basis could one decide that one witness is more reliable than another (for example, a witness who was mature at the time compared with one who was a child). Talk about how historians distinguish between historical fact and historical interpretation, then provide accurate information about each event and its historic impact as needed. Close the lesson by asking students to think of an event they have witnessed during their lives that someone twenty-five years from now might consider historic. This could be an event in your local community, a scientific or technological development, a sports achievement, or a family milestone. Provide a suggestion or two to help jog your students' memories and steer them from very private events, like the death of a cherished pet, toward more public events. You might also guide students toward almanacs, newspapers, and online news sites to broaden their sense of significant events. Have each student draw a picture of the event they have witnessed and provide a brief caption, giving its date, a description of what happened, and an explanation of its importance. Then compare these "eyewitness reports" in a class discussion, imagining what historians of the future will write about our lives today. 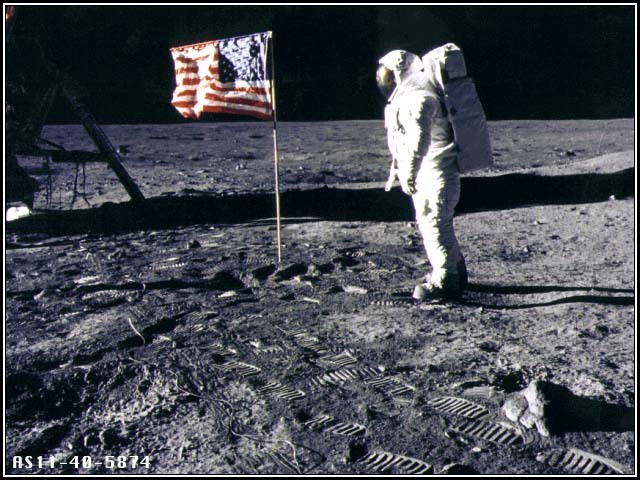 Older students can continue their investigation of these landmark events using the EDSITEment resources listed above. Divide students into groups and have each group develop a dossier on one event, collecting evidence from assigned web pages. Ask each group to report on its event or to create a classroom display explaining its significance. Enter keywords "March on Washington," "Vietnam," "Computer," and "Sandra Day O'Connor" to search for the images used in this lesson. How can we learn from those who have lived through important events in history?